Q- When will my order begin? A- Your order will begin within 1-24 hours. After you place your order, an admin will email you back once your order is ready to begin, with details pertaining to your order. Q- Does this service break any Poshmark Policies? 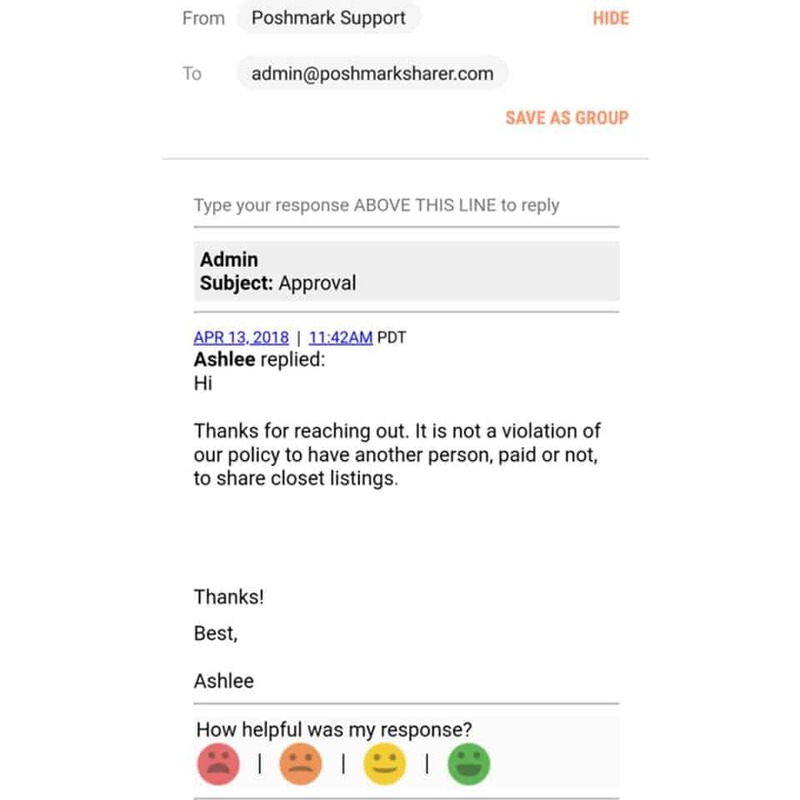 A- Our unique sharing service does not break any policies with the Poshmark network. Our shares are done by real people, jamming out to music and eating Doritos. Poshmark’s terms of conditions states, hiring a virtual assistant is not against any policy. Q- Can I pick who shares my closet? A- When you place your order, your order will be given to whomever is available for sharing . Q- How will I know who is sharing my closet? A- You will notice a steady stream of shares from a particular posher. Q- How come I didn’t make any sales from your service? A- Our goal is to make you as many sales as possible however, just like the lottery there are some things we can’t control. We complete the work which leads to you generating sales. If you feel like you’re not making the amount of sales you’d like to be making, considering repricing, offer discounts to likers, ENL or retaking cover photos. You can find many tips within our blog posts. Q- If I invite my friend to Poshmark Sharer, will I earn credit? A- Yes, you will earn credit for each new customer you refer while using your unique referral link. Q- What is the “Refer a Friend” program? Refer a friend to PoshmarkSharer.com and earn up to $50 per referral. Your unique referral link is located within your account section, under ” Reference URL”. Q- Can you share my closet from my account? A- Yes we can share your closet from your account but we would need your password and you will have to give electronic consent. We will then ask you to change your password to a password given to you by us. Once we are done sharing from your account you can switch your password back to your original password. 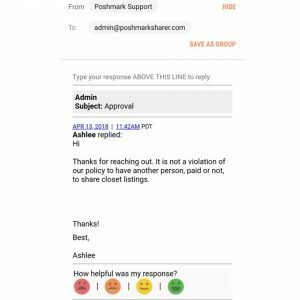 Q – Is it against Poshmark’s policy to use your service?